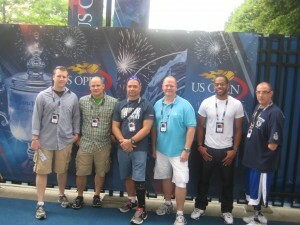 For three years in a row, the U.S. Tennis Association (USTA) has partnered with Freedom Alliance to enable wounded combat vets to be a part of the tennis action at the U.S. Open in New York City. Military outreach coordinator for the USTA, Robin Jones, is our long-running hostess, and she provides the special perks for our men and women in uniform. For this year’s trek to the Big Apple, a ten-passenger party bus exited Walter Reed National Military Hospital with a fun-loving group of guys. U.S. Army soldier Keith, from Houston, Texas, is a member of the First Rangers. Now at the end of his military career, he assists injured soldiers who are in the recovery or transition process at Walter Reed. “We are sitting in traffic and I’m already having a great time!” Keith exclaimed. While the bus maneuvered its way into the perpetual traffic backup, the Walter Reed gang was snacking, watching a movie, and hardly noticing the delay. We finally made it downtown and waded through the lobby at the Midtown Grand Hyatt, which was packed with tennis players, USTA personnel, and fans. After stowing the luggage in our rooms, we met our old buddy James from My Kind of Town Tours. He took us first to Grand Central Station, then to Times Square … and then, for the piece de resistance, James conducted a whirlwind, five-hour tour of the best eating establishments in the city. “Get ready, fellas, to eat like you’re getting ready for the electric chair,” he said with a knowing grin. When Sergeant Kevin bit into a hot pastrami and mustard at Artie’s Deli, we knew from his face that we had found sandwich heaven. The sergeant is the veteran of four deployments, with almost daily firefights. The pastrami was so much more than a delicacy for this member of the SOCOM (Special Operations Command) Warrior Transition Battalion. Strange as it may sound, that bite was a symbol of survival and the America he fought for. Just ask Kevin! In addition to the deli, James took us to an eatery that only sells French fries, and another with more than thirty varieties of mac and cheese. We sampled lobster rolls at Luke’s Lobster and ate pizza in Little Italy. 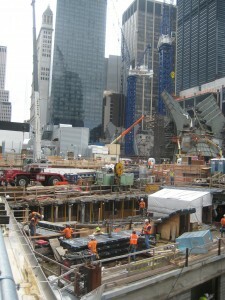 We had been all over the city, but still felt it necessary to “walk it off,” lumbering around the financial district until stumbling back to bed. 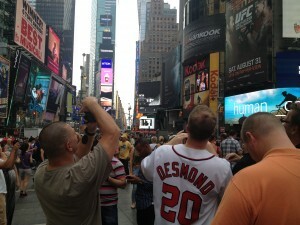 For our soldiers, this tour of New York City was right up their alley. 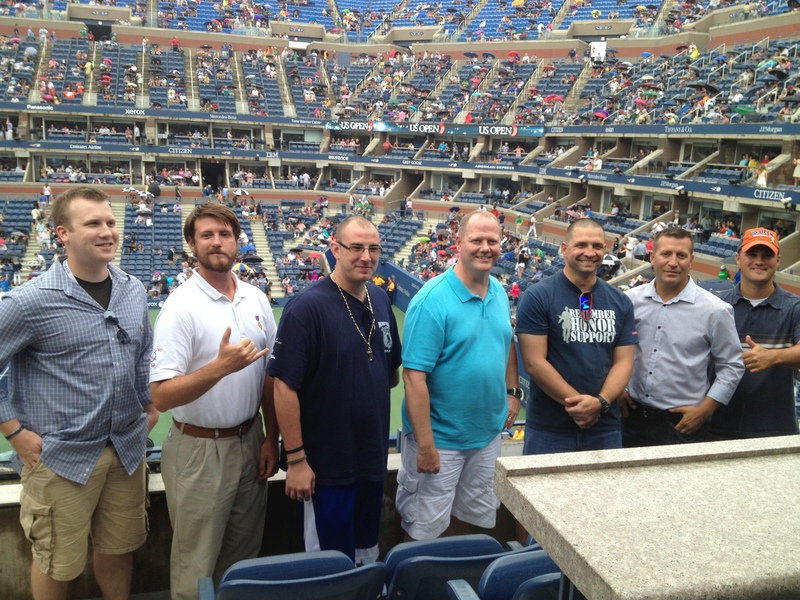 Breakfast was not required the next morning, but our luxury box suite at the Arthur Ashe Tennis Complex in Queens was beckoning. We were first treated to a tour of the facility and happened to encounter Venus Williams entering the stadium. Army Sergeant Bryan, a triple amputee from Brooklyn, met us with his mom, Maryjane, who is a tennis fanatic. 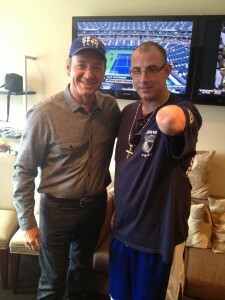 We also were joined by Ian, a corpsman who was involved in a disastrous mortar explosion this past March. Keith, who played tennis competitively in high school, and Senior Master Sergeant Barry were also keen fans and pumped up for action. There was a rain delay after the third set, but the guys were content to hang out in their suite and attack the refreshments. 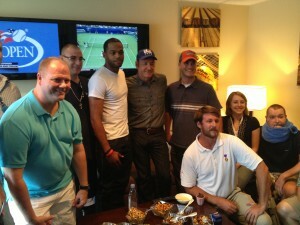 Some of the players came up to say hello, and actor Kevin Spacey surprised the group by making an appearance as well. When the weather cleared, the stadium honored our heroes with a standing ovation from all the fans. Then the matches continued on into the evening. The next morning began with a Big Apple breakfast, and next it was on to our last stop while in New York: the 9/11 Memorial. 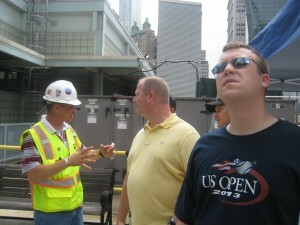 Dropped off in front of the Freedom Tower, we stood on the sidewalk to find a ticket booth, when a man in a hard hat approached the group. Recognizing fellow veterans, he offered our troops a behind-the-scenes tour of the facility. It was completely by chance, but we gave ourselves willingly over to Mike, a former Army warrant officer and medevac pilot, who flew missions during the invasion of Fallujah. Currently the Port Authority’s senior safety engineer for the “One World Trade Center” project, he was able to give us the inside story about the construction. Mike also took us over to “Ten House,” the closest firehouse to Ground Zero, which was destroyed when the north tower fell, killing five firefighters. Having since been rebuilt, the Ladder 10 Firehouse includes memorials and relics from that tragic day. The gang was floored to have received such a personal, customized visit, and what a perfect ending to three days of excitement and surprises. Being at Ground Zero was a fitting reminder to our service members of the meaning of their service and sacrifice. New York City never ceases to inspire, and neither do our military members.